Kenogami Lake – where Kirkland Lake goes to find a lake. Ok, that’s not the town motto. Kenogami, which means “long lake” in Montagnais or “long water” in Cree, (or neither, according to a comment below), is a river about 15 kilometres north of Kirkland Lake on Highway 11. Kenogami used to have a little sawmill, I didn’t see any homes in Kenogami Lake, per se, but there were lots of cottages along the beautiful river with numerous little piers and boat docks along the shore. The river crossing is a nice little break from the forests and truckstops of the highway, and makes a nice stop if you’ve been travelling far and don’t plan on stopping in Kirkland Lake. 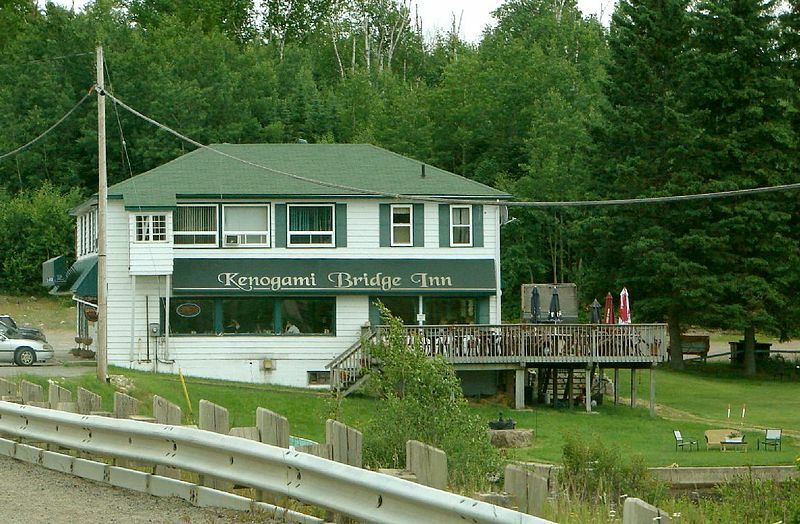 The Kenogami Bridge Inn has wing nights every Monday and Tuesday. I was there on a Monday night and there were eleven cars while I was there. I didn’t venture in but things sure smelled good, and the patio would be absolutely serene were it not for the traffic on Highway 11. There’s a marine shop across highway and I’ve seen ads on the highway for Kenogami Trash n’ Treasures, which sells some old cast iron cookstoves among other things. South of the bridge over the Kenogami River there’s Delean’s Restaurant, a gas station, and an old chocolate factory that I’m told went bust when its owners, a married couple, unfortunately split up. Further south there is MacPherson’s General Store, which sells munchies, liquor, and gas. There’s also – get this – a gun shop in Kenogami. Yes, a gun shop. Maybe my existence up until then was too sheltered, but this is only the third gun shop I’ve ever seen in my life (the others being Fred’s Gun Repair and Buy-Sell-Trade in Delhi, and Giovanni’s Gun Shop on Wilson in Toronto, those two I remember passing in the car as a kid.) We’ve all seen the rifles locked away in Canadian Tire, but when I read ‘gun shop’ my mind went ‘huh?’ until I realized that we’re in the middle of hunting country. Pretty and calm, Kenogami Lake is a nice spot to stop and admire the handsome beauty of northern Ontario, before hitting the washrooms and hitting the road. This entry was posted in Temiskaming and tagged boating, dot on the map by Highway11.ca Editor. Bookmark the permalink. My family owned the ‘bridge’ restaurant and bar from 1979 until mid to late 1980′s. We moved up from Toronto when I was in high school and I learned a lot about life living in Kenogami. My families roots are in the Kirkland Lake area and we had a family cottage on lake Sesekinika – about 5 miles north – for many years.There are (were) beautiful homes on the lake but can’t be seen from the highway. Fishing and water skiing in the summer, snowmobiling in the winter, and always adventures and life-long friendships that made my short time there a big part of me. My parents ran the Red Pine Lodge on Kenogami Lake, and we lived there from the early 50s until 1961 when, three years after my father Bob died, she sold it and moved to Hull, Quebec while I left for the RCAF. Extraordinary memories, most good, some not, but never to be forgotten. My parents built a beautiful home in kenogami. Before that they lived in sesekinika. The house is so beautiful and the deck overlooks the lake. I remember going there for a visit and at night it was so quiet and peaceful.all you could hear was the wind whispering through the pines!nothing quite like it. One of my fondest memories was, when I was talking to my mum in her bedroom and we glanced out the window at the same time. We both just said !on my!we had seen the moon shining on the water and it was such a beautiful picture.also the northern lights!!! !.so many memories.kenogami is a great place to live and l love it but, sesekinika will always be home.Ontario is such a wonderful prov. With so much to offer.l am in. Alberta. Now it also has many things to offer. The mountains for one and there is much more. Every place l have lived has been great. It’s just that my heart has always been in sesekinika and the comments that l have read says l am not alone.my parents now live in Kirkland.Joyce and Ron Mcgugan. My mum just turned 90 years young. My brother now lives in the house at kenogami. Nice to hear from people and share memories. Best wishes to you all and who knows? Maybe we will see each other one day in sesekinika , kenogami, Kirkland, matheson etc.etc. Pat Morin, Mcgugan. Grew up as a child spending my summers on Kenogami. There were a group of families who went back each summer. The Frisbies, the Woodhouses, the Roys, my grandparents, George and Kathleen Johnston, my parents, Barb and Roland Lalonde and many others. Many great memories and some old pics of the annual events they used to hold help to keep them fresh. As a daughter of the owner of Reed’s Cottages on Kenogami Lake, spending holidays and parts of summers there was the best way a child could spend their time. I loved the peaceful, healthy atmosphere, the boating, fishing, and ice skating and hockey on the ice of Kenogami Lake near Christmas time. I’m too far away now to get there anymore but the people and the good times at Kenogami will never be forgotten. Kenogami’s Kitchen has replaced Delean’s Restaurant and the associated gas station is now closed and all pumps removed. Interestingly enough, the large road-visible sign say’s “Can-Op Gas and Kenogami’s Kitchen”… but the gas station is definitely non-existent. .
Do you have a brother named Steve? I believe that he and my son were briefly acquainted at the Frontier Lodge back in 1996. It would be fun to try and get them back in touch after so many years! Please let me know. hundreds of lakes in kirkland area, and hundreds of homes in kenogami, did you even talk to a local? One minor correction: there are homes on Kenogami Lake, but you have to take the roads back into the area to see them. They are interspersed with many cottages, though. yeah, we have a place in sesekinika, i think that the car on the ice is a fundraiser for the local fire department. i am pretty sure that i have seem signs for it. people wager when it will fall through. You mean Herbie (the yellow car)I don’t recall the car being red but they have been doing it for a longtime so it may have at one point. I grew up on Kenogami and hope to return one day and buy property. My family owns land north of Kenogami, in Bourkes. I remember when I was young in the late 80\’s, I have a vague memory of a little red car being parked out on the ice. Does anyone know if this was a regular thing? I believe they held a lottery on which day it would go through the ice in spring for fundraising. Well I can vouch for the car on the lake! It was an old VW, stripped of everything inside. No motor or gas tank. The Kenogami Volunteer FD. was involved. We sold tickets for each minute of the day. There was a clock inside the ‘Bug’ that would stop as soon as it hit the water. We would go out in a boat and retrieve the clock to find out who won the draw! Then go back in the spring, raise the car from the bottom with tire tubes and drag it back to shore for next year. I was there from 1984 to 1987. Great place ! Yep we still own land. I live in Niagara now, but I get up there as often as I can! in the summer and snow mobiling, snowshoing, lake rinks, ice fishing and tons of other kids to hang with. I remember the Reeds, Bains, McGinnis’s, Merrila (sp), Duncans and many more. Kenogami gave me a well balanced childhood that has helped me be the person I am today. Times change as we do but I remember Kenogami fondly. yes even those -65 days…. dress warm and be safe all and long live Kenogami. Just a few comments. Your story is not far off base. However, I’m not sure why you’d interpret the name using either Montagnais (WTF?) or Cree. That part of the country is a mixture of Ojibway and Algonquin. Regardless, the interpretation “long lake” is accurate. 1. Yes, that is where Kirkland Lakers go to find a lake… because they’ve filled Kirkland Lake with mine tailings. 2. Actually, there are as many homes as cottages if not more. Not that that is necessarily a good thing. 3. Kenogami is West of Kirkland Lake as far as I can tell, and MacPhersons’s is North of Kenogami as well.